Years ago, retail organizations gathered customer lists. That list became a database, which linked to early call center software. Then it grew with the sales funnel: suspects, prospects, lapses and repeats got labelled, glued on, stitched together. As customer segments fragmented and media channels broadened, other applications—customer relationship management (CRM) packages, custom customer service agents (CSA) forms, interactive voice response (IVR) management dashboards—got layered on top. Vertical integration of contact center technologies leads to brittleness. 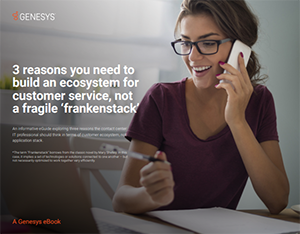 Explore three reasons the contact center IT professional should think in terms of a customer ecosystem, not application stack.